i stopped by bloomies after work last night and could not believe my eyes. it was fall, in the middle of the worst of the summer heat! but it was all sooo lovely... i love summer, but there's just something about layers in the fall, gets me all excited! i never fail to be surprised when the stores stock up on fall/winter merchandise right at the beginning of the last couple of months of summer. with the sweltering 98 degree weather we had yesterday, the last thing i wanted to do was bundle up in sweaters. nevertheless, being the fashion-phile, or style-phile, that i am, i loaded up an armful of stylish buttonless cardigans and headed for the dressing room. i love love loooooove the wrap cardigans from vince... so luscious in cashmere! and the belts are sooo cute, these are definitely on my fall to-purchase list. plus, they will look superfab with skinny jeans! besides, wearing these cardigans mean i won't have to immediately ditch the summery camisoles that i love so much. 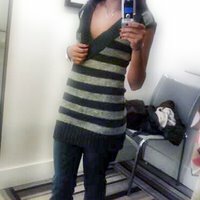 i bought a long sleeveless charcoal and black striped sweater, my first pre-fall-fall-ish purchase!